The global nutricosmetics market is expected to unveil substantial growth in the forthcoming years, especially due to the growing elderly population globally. Furthermore, factors such as increasing demand for natural products for health and beauty due to fewer side effects and rising healthcare costs are stirring growth of the global nutricosmetics market. Nutricosmetics are orally consumed natural health products that contain target nutrients and antioxidants for the treatment of skin, hair, and nails. They are available in the form of beverages, beauty supplements, or functional foods, or that contain active ingredients along with ingredients such as proteins, enzymes, minerals, botanical leaves, lycopene, etc. that are developed and marketed mainly as beauty aids. Nutricosmetics are available as tablets, pills, jellies, capsules, and drinks. The drift toward a healthier lifestyle and the positive effects of ingredients such as green tea, roots, and barks that supports “Beauty from within” is increasing the demand for nutricosmetics at the global level. However, lack of awareness among consumers about the benefits of nutricosmetics is acting as a bottleneck to the growth of this market. The relatively new availability of these products has been a reason for their low credibility among consumers. Furthermore, longer time for nutricosmetics to show results is challenging the growth of nutricosmetics market. 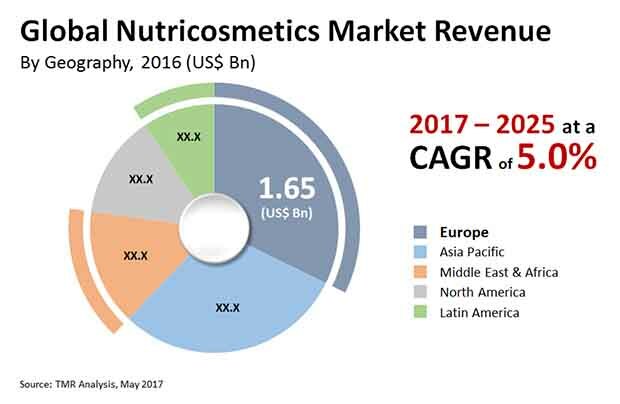 The global nutricosmetics market pegged an opportunity of US$5.13 bn in 2016 and is poised to reach US$7.93 bn by 2025, progressing at a CAGR of 5.0% between 2017 and 2025. In terms of product type, the nutricosmetics market is segmented into supplements and beauty beverages/drinks. In 2016, supplements stood as the leading product type segment and is estimated to retain its position with 54.1% of the market by the end of 2025. Among supplements, tablets held the leading market share in 2016 and is expected to maintain its position during the forecast period. By primary function, the global nutricosmetics market is segmented into skin care, weight management, hair and nail care, and multi-functional. Skin care comprises sun care, radiance and glow, anti-ageing, and anti-acne pimple. Skin care held the leading market share amongst other segments in 2017 and is expected to lead until 2025, albeit with a declined market share. However, sun care is expected to display the leading growth rate between 2017 and 2025. On the basis of distribution channel, the global nutricosmetics market is segmented into modern trade, specialty stores, health and beauty stores, pharmacy stores, and e-commerce. Amongst these, pharmacy stores stood as the leading distribution channel and is anticipated to maintain its dominance throughout the forecast period. On the other hand, health and beauty stores is gaining momentum and is anticipated to display the leading growth rate until the end of 2025. On the basis of geography, the global market for nutricosmetics is segmented into North America, Asia Pacific, Europe, Latin America, and the Middle East and Africa. While North America displayed the leading growth in 2016, Europe captured the leading market share due to high penetration of nutricosmetics combined with high adoption rate among consumers as well as high awareness about products’ benefits. Product manufacturers in Europe are strategizing for acquisitions and joint ventures in order to grab opportunities in the global market. While Asia Pacific held the second-leading share in the global market in 2016, the region is expected to surpass all regional segments in terms of market share by 2025. Some of the key players in the global nutricosmetics market include Cargill Incorporated, E.l.Du Pont De Nemours and Company, Nestle S.A., The Coca-Cola Company, and L’Oreal SA. Nutricosmetics is an oral based natural heath products which include specific nutrients and antioxidant that provides treatment or prevents problems in skin, hair and nails arising due to several deficiencies such as lack in vitamin B12, vitamin D, vitamin A and vitamin C. Consumers over the years have become conscious about the wellbeing of the skin, hair and overall health. The global Nutricosmetics market has been segmented on the basis of product types, primary function, distribution channel, and region. Based on product types, the market has been segmented into supplements and beauty beverages/drinks. The supplements have been further segmented into tablets, capsules, powder and liquids. Based on primary function, the market has been segmented into skin care, hair care, nail care, weight management and multifunctional. Skin care has been further segmented into sun care, anti-aging, radiance, and glow, anti-acne, pimple. The market has been further segmented on the basis of distribution channel into modern trade, health and beauty stores, specialty stores, pharmacy stores and E-commerce. The report also analyzes factors driving and inhibiting growth of the glass tableware market. The report will help manufacturers, suppliers, and distributors to understand the present and future trends in this market and formulate strategies accordingly. The market has been tracked in terms of revenue (US$ Mn) and the same has been segmented based on product type, primary function, and distribution channel. The demand for organic products among the consumers have surged to a great extent in the past few years, on account of increasing awareness about the benefits offered by natural products. Synthetic products are inclusive of harmful chemicals that may have adverse effects on human health. Due to this issue, health conscious consumers are shifting their focus towards natural products. Introduction of new innovative nutricosmetic products having organic elements is another key factor driving the sales of nutricosmetic products. In recent periods, products have been launched presenting innovative elements such as oils, barks, fruits, roots, and seeds. In addition, fruit extracts, green tea, and coenzyme Q10 are the other commonly used ingredients in nutricosmetic products. These are some major factors responsible for the switch from synthetic products to natural products. The popularity of nutricosmetics among the aging population is also considered as one of the key drivers of the global nutricosmetics market. Rapidly growing base of aging population coupled with increasing awareness about health and wellness is also fuelling the demand for nutricosmetics at present. Additionally, many countries across the globe are expected to serve as potentially good markets for nutricosmetic products. For instance, the demand for nutricosmetics products has increased in Asia Pacific. In addition, Japan has made rapid progress with regards to the growth of this market. Further, China is expected to register a healthy growth in the forecast period. Taiwan and South Korea are expected to be lucrative regions for nutricosmetics in coming years. Moreover, in this report, the study provides different countries included in different regions such as North America, Europe, Asia-Pacific, Latin America and the Middle East and Africa. Europe which includes EU5, Nordic, Russia, and Poland among the other regions dominated the global Nutri cosmetics market due to rising consciousness regarding health and beauty among the people. EU5 among the other regions in Europe captured a large part of the market share in 2016. Asia Pacific which includes India, China, Japan, Australia and New Zealand among the other regions also captured a significant market share in 2016. Japan dominated the Nutri cosmetics market among the other regions due to its product launches in recent years which include collagen-based drinks and vitamin infused sodas. North America, which includes the U.S. and Canada showed the fastest growth rate during the forecast period due to the rapid adoption rate of nutricosmetics among the consumers. The report provides company market share analysis of the various key participants. Key players have also been profiled on the basis of company overview, financial overview, business strategies and SWOT Analysis. Global key participants of the cosmetic ingredient market include Cargill Incorporated (Minnesota, U.S.), E. I. Du Pont De Nemours and Company (Delaware, U.S.A.), Nestle S.A. (Vevey, Switzerland), L’Oreal SA (Clichy France), The Coca-Cola company (Atlanta, Georgia, U.S.A.), Skinside AG (Switzerland), Croda International Plc (East Yorkshire U.S.A), Pfizer Inc.(NewYork, U.S.A), Frutarom Industries Limited (Haifa District, Israel), Nutrikosm (Barcelona, Spain), Robinson Pharma Incorporated (Santa Ana, CA, U.S.A.), Shiseido (Tokyo, Japan), Ashland Incorporated (Kentucky, U.S.A.), Vitabiotics Company (London, U.K.), Medcoll Bio (Westmeath, Ireland).